First Phase of GHS Training Due Today (12/1/2013) – Are Your Employees Trained? OSHA revised its Hazard Communication Standard (HCS) to align with the United Nations’ Globally Harmonized System of Classification and Labeling of Chemicals (GHS) and published it in the Federal Register in March 2012 (77 FR 17574). Two significant changes contained in the revised standard require the use of new labeling elements and a standardized format for Safety Data Sheets (SDSs), formerly known as, Material Safety Data Sheets (MSDSs). The new label elements and SDS requirements will improve worker understanding of the hazards associated with the chemicals in their workplace. To help companies comply with the revised standard, OSHA is phasing in the specific requirements over several years (December 1, 2013 to June 1, 2016). The first compliance date of the revised HCS is December 1, 2013. By that time employers must have trained their workers on the new label elements and the SDS format. This training is needed early in the transition process since workers are already beginning to see the new labels and SDSs on the chemicals in their workplace. To ensure employees have the information they need to better protect themselves from chemical hazards in the workplace during the transition period, it is critical that employees understand the new label and SDS formats. The list below contains the minimum required topics for the training that must be completed by December 1, 2013. ✓ Product identifier: how the hazardous chemical is identified. This can be (but is not limited to) the chemical name, code number or batch number. The manufacturer, importer or distributor can decide the appropriate product identifier. The same product identifier must be both on the label and in Section 1 of the SDS (Identification). ✓ Signal word: used to indicate the relative level of severity of hazard and alert the reader to a potential hazard on the label. There are only two signal words, “Danger” and “Warning.” Within a specific hazard class, “Danger” is used for the more severe hazards and “Warning” is used for the less severe hazards. There will only be one signal word on the label no matter how many hazards a chemical may have. If one of the hazards warrants a “Danger” signal word and another warrants the signal word “Warning,” then only “Danger” should appear on the label. ✓ Pictogram: OSHA’s required pictograms must be in the shape of a square set at a point and include a black hazard symbol on a white background with a red frame sufficiently wide enough to be clearly visible. A square red frame set at a point without a hazard symbol is not a pictogram and is not permitted on the label. OSHA has designated eight pictograms under this standard for application to a hazard category. ✓ Hazard statement(s): describe the nature of the hazard(s) of a chemical, including, where appropriate, the degree of hazard. For example: “Causes damage to kidneys through prolonged or repeated exposure when absorbed through the skin.” All of the applicable hazard statements must appear on the label. Hazard statements may be combined where appropriate to reduce redundancies and improve readability. The hazard statements are specific to the hazard classification categories, and chemical users should always see the same statement for the same hazards, no matter what the chemical is or who produces it. ✓ Precautionary statement(s): means a phrase that describes recommended measures that should be taken to minimize or prevent adverse effects resulting from exposure to a hazardous chemical or improper storage or handling. ✓ Explain how information on the label can be used to ensure proper storage of hazardous chemicals. 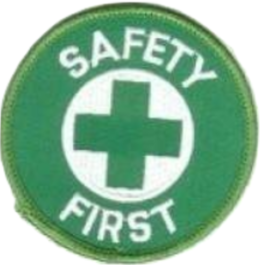 ✓ Explain how the information on the label might be used to quickly locate information on first aid when needed by employees or emergency personnel. ✓ Explain that where a chemical has multiple hazards, different pictograms are used to identify the various hazards. The employee should expect to see the appropriate pictogram for the corresponding hazard class. ✓ Explain that when there are similar precautionary statements, the one providing the most protective information will be included on the label. ✓ For example, the employee should be instructed that with the new format, Section 8 (Exposure Controls/Personal Protection) will always contain information about exposure limits, engineering controls and ways to protect yourself, including personal protective equipment. • How the information on the label is related to the SDS✓ For example, explain that the precautionary statements would be the same on the label and on the SDS. As referenced in Dr. Michaels’ OSHA Training Standards Policy Statement (April 28, 2010) – with all training, OSHA requires employers to present information in a manner and language that their employees can understand. If employers customarily need to communicate work instructions or other workplace information to employees in a language other than English, they will also need to provide safety and health training to employees in the same manner. Similarly, if the employee’s vocabulary is limited, the training must account for that limitation. By the same token, if employees are not literate, telling them to read training materials will not satisfy the employer’s training obligation. Federal Register: The Final Rule was filed on March 20th at the Office of the Federal Register and available for viewing on their Public Electronic Inspection Desk. The Federal Register published the final rule on March 26, 2012. The effective date of the final rule is 60 days after the date of publication. ‹ PreviousEHS Safety News Stars in “Toxic Hot Seat” on HBO!